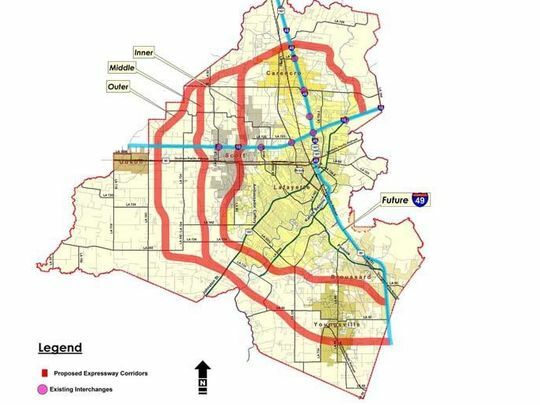 Thursday, February 28, 2019, at the Lafayette Parish South Regional Library, the State of Louisiana will host a public hearing on their plans to build a western bypass around the City of Lafayette. The meeting will continue from 5:30 to until 7:30 pm. The host agency for the meeting is the Lafayette Metropolitan Expressway Commission or LMEC. Beginning almost twenty years ago, efforts and support of Lafayette civic leaders led to the creation of the LMEC by our Louisiana Legislature in 2003. The LMEC provides oversight for construction planning and financial planning for a proposed Lafayette limited access interstate bypass. They call their proposed bypass the LRX or Lafayette Regional Xpressway. After years of work, plans have progressed, and the LMEC is seeking your comments on their Tier 1 Draft Environmental Impact Statement (EIS) which evaluates potential alternative highway corridors. The plan is for the LRX to be partially funded by tolls as part of a public-private partnership (PPP). As such, this project might be funded and built long before the costly I-49 connector (I-49 Con) project moves a shovel of dirt. The state will not say that the LRX is an alternative to the widely-opposed and costly I-49 Connector. I assume this is necessary to avoid loosing federal planning funds. However, the choice is clear - the LRX eliminates the reasons for building the I-49 Connector. If it is not an alternative then let's call it a substitute. If well managed and designed, the LRX substitute is financially a better deal for taxpayers. The LRX should have little or no flood impact, unlike the I-49 Con it will not cross a massive abandoned toxic site or impact our drinking water, and it will reduce traffic congestion in the city while giving rural residents new travel options. You can learn more about the LRX plan through the LMEC website http://www.lrxpressway.com/Their meeting announcement is available by clicking HERE. 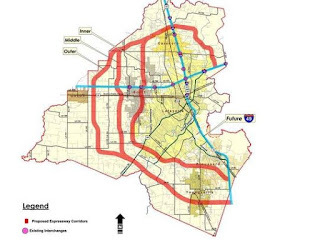 DevelopingLafayette.com published an excellent article titled "Lafayette Metro Expressway “Lafayette Loop” Planning Continues.". And Claire Taylor published an article in The Advocate titled "Public can weigh in on Lafayette toll loop during Feb. 28 meeting." Click on the titles to read these articles. Your comments to the LMEC and state DOTD will be accepted at the meeting. If you are unable to attend, or just want to give additional comments, you can submit your comments via their Web site (www.lrxpressway.com), or by U.S. mail to LRX Project Team, HNTB Corporation, 10000 Perkins Rowe, Ste. 640, Baton Rouge, LA 70810. Any written comments received by or postmarked on or before March 11, 2019 or 45 days following publication of the Notice of Availability in the Federal Register, whichever is later, will become a part of the record. After the February 28 meeting I will publish an article here in Connector Comments detailing new LRX developments and comments I hear from other participants. I urge you to support the LRX and help save our city and parish from the disaster that is the I-49 Con. Alternative LRX corridor map from 2017 public meeting. projects involving large numbers of people and usually heavy expenditure, where at some point, the key operators, having realized that the project will never work, are still reluctant to bring this to the attention of their superiors. Public opposition to routing I-49 through the heart of our city goes back at least to 1992, and for years now, Lafayette residents have recognized that the government project now being called the Lafayette I-49 Connector (we call it the I-49 Con) is a prime example of a wasteful government boondoggle (for an example of public comment read "Why the I-49 connector won't work" published May 27, 2016 in the Daily Advertiser). The public has been assured many times that if there is significant public opposition to the project it will never be built. Yet, the I-49 Con continues spending tens of millions of tax dollars on studies and design that will never be used for a footprint through the heart of the Lafayette. Sarah Palin holding a T-shirt related to the Gravina Island Bridge. Regardless of how wasteful the project, politicians from both sides of the aisle often find it hard to oppose tax funded boondoggles. Perhaps this is because of the inevitable cycling back of a percentage of the money into campaign contributions. Even some of the most conservative politicians seem unable to pass up wasteful government boondoggle projects. 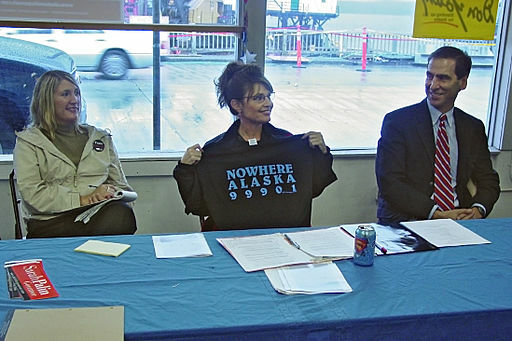 Do you recall the support of Sarah Palin for federal funding of the Gravina Island Bridge commonly referred to as the iconic "Bridge to Nowhere?" The national Public Interest Research Group (USPIRG) published their 2018 list of US interstate highway boondoggle projects. If built as proposed, these boondoggles would waste tens of billions of our federal transportation tax dollars. And, even if these boondoggles are never built, billions will be spent on their planning and design before public pressure and simple rationality end their useless authorizations. Although our own local boondoggle, the I-49 Con, did not make the USPIRG list this year, its sister project in Shreveport, the Shreveport I-49 Inner City Connection did make 2018's national list of worst boondoggles. Better luck next year to our own I-49 Con! If USPIRG accepts nominations in 2019 the I-49 Con will have my vote. It is important that our political representatives hear from their voters about stopping these federal transportation boondoggles. If we don't speak up the only voices our leaders hear come from paid lobbyists representing the corporations and contractors who are hoping to continue getting design and construction contracts. Several of the candidates spoke to the forum in general terms about our need for improved infrastructure and the need to eliminate wasteful federal spending. However, two candidates spoke directly about problems with routing I-49 through the center of Lafayette. Congressman Clay Higgins noted that routing the interstate footprint through the central city would displace or impact a large number of private property owners. He concluded that an actual footprint for the project still needs to be selected. Candidate Mimi Methvin cited further problems with the central city route including its planned passage through the highly contaminated former railyard site. Furthermore, she noted that today urban experts and planners recognize urban blight in many US cities has been caused by the past construction of inner-city interstates. Do you agree that the Lafayette I-49 Con is one more federal boondoggle currently wasting many tens of millions of tax dollars on design of a route through the heart of our city? Do you agree that, as now planned, the I-49 Con should never and likely will never be built? If your answer is yes, I urge you to contact your chosen 3rd district candidate. Tell him/her of your opposition to the currently proposed central I-49 route. Ask your candidate to support planning for one of the much less costly and less damaging alternatives bypassing Lafayette to the east along the Teche Ridge or west following the plan for the Lafayette Regional eXpressway (LRX). In addition to saving federal and state taxes, either alternative also involves much lower cost to our local governments, reduces risks to property and health, and eliminates most impacts to flooding and traffic congestion inherent in the I-49 Con planned route through the heart our city.